The essential step-by-step guide for how to cook bacon in the oven. Two simple baking methods can be used for either chewy or crispy bacon with delicious results. This recipe is for all of the bacon lovers of the world. 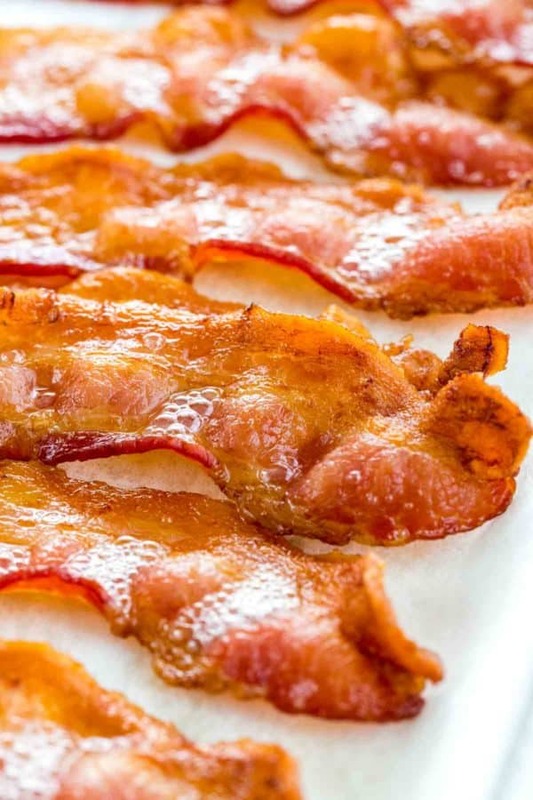 Whether you enjoy a thick, chewy texture or more light and crispy pieces, this step-by-step guide for how to cook bacon in the oven will be your go-to resource. I’ve been using this method for years, resulting in perfectly cooked bacon every time. 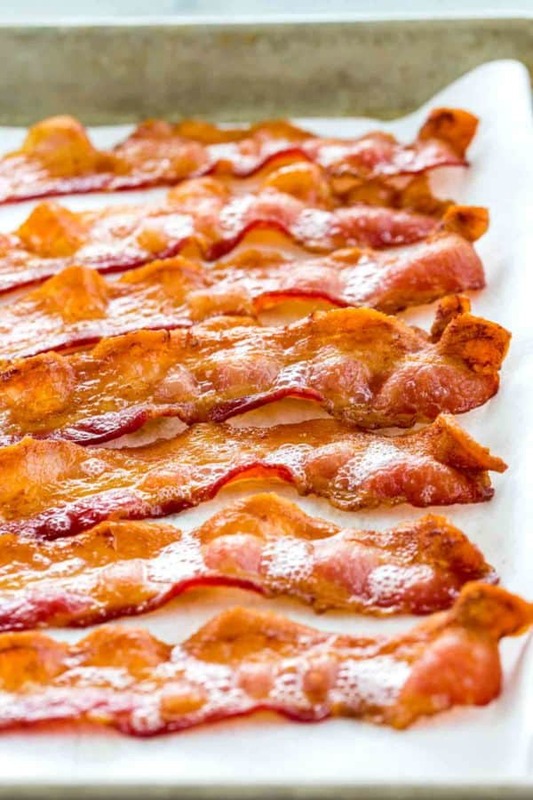 When baking bacon, there are two ways to cook it, straight on the baking sheet or on a rack. The differences are subtle, but connoisseurs will appreciate the changes in texture. Learn my tips for making golden and crispy bacon in batches so that you can feed a crowd or meal prep for the week. The first thing to decide is what type of bacon to roast. There are many types and sizes available, from uncured, cured, hickory smoked, applewood, and thickness, the selections are endless. For me, it comes down to taste and crispiness factor. The thinner the bacon the more crispy, but also more delicate. The thickness will also affect the time it takes to prepare. Use this recipe as a basic guideline and keep a close watch on how long your preferred bacon takes to reach a golden brown color and desired texture. My bacon of choice is natural, smoked, uncured bacon that is of regular thickness (not thin or thick). To me, it gives just the right balance of chewy center, crisp edges, and savory taste. Now is where it gets exciting. There are two methods of cooking bacon in the oven, directly on the baking sheet pan or on top of a cooling rack resting in the pan. How do you choose? No matter what the bacon will taste incredible, but here is what you may perceive. 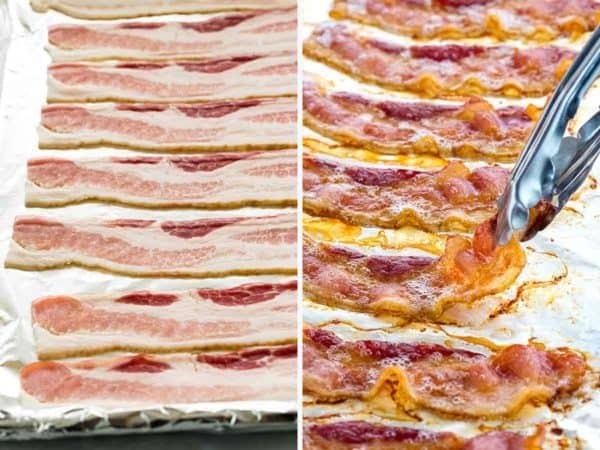 Baking Sheet Pan: When the bacon is cooked straight on the pan, it tends to be slightly more chewy and hearty, unless you bake it until it’s shatteringly crisp. Cooling Rack: Bacon made on the rack takes a few more minutes to cook because it’s not frying in the hot rendered fat. The result is more crispy along the edges, lighter in texture, and has a slightly more wavy appearance. The only downside? More dishes to clean. Line the baking sheet pan with foil, making sure it covers up the sides. Evenly space the bacon apart, be careful not to overlap so that the protein is consistently cooked and doesn’t stick together. Bake at 375°F (191°C) for 15 minutes, then carefully flip over and cook until the bacon is fully cooked, golden in color and crisp, about 5 minutes depending on the thickness. Make sure to keep a close eye on the last few minutes because the bacon can go from crisp to burnt! Transfer bacon to a paper towel-lined plate to drain the excess bacon grease. Line a baking sheet pan with foil, making sure it covers up the sides. Use an oven-safe cooling rack that does NOT have a nonstick coating as that type can break down in the hot oven. Place rack in the center of the sheet pan. Arrange the bacon on top of the rack so they’re evenly spaced apart and don’t overlap. Bake at 375°F (191°C) for 15 minutes, then carefully flip over and cook until the bacon is fully cooked, golden in color and crisp, about 8 to 10 minutes depending on the thickness. Transfer bacon to a paper towel-lined plate to drain the excess bacon fat. Cooking bacon in the oven is the one thing that is always on my to-do list each week, usually on Sundays. Why? I meal prep for my husband so he can make breakfast in the morning in less than 5 minutes. We also save a ton of money because Jason doesn’t go to Starbucks like he used to for coffee and a bacon breakfast sandwich. From a Ziploc bag, Jason grabs a slice or two of bacon in the morning and wraps in a sheet of paper towel. He microwaves it for just a few seconds just to get it warmed up for his breakfast tacos. It’s pretty amazing to see how he’s perfected his morning routine. 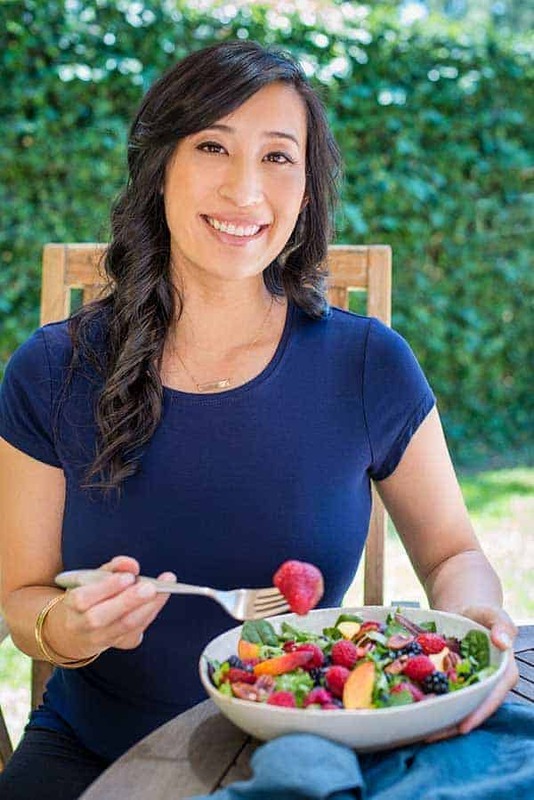 Now that you have a plate full of tasty bacon, you can devour right away, or it can be easily stored once cooled in a resealable plastic bag for up to one week in the refrigerator. Microwave it like my husband, add it to a hot pan to crisp, or chop it up for a salad. 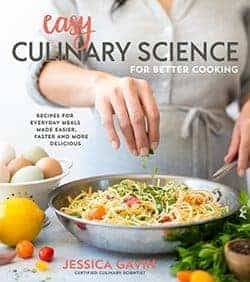 Once you have some bacon available at all times, I’m sure you will be adding it to make the flavor pop in your dishes, or as the star on the plate! 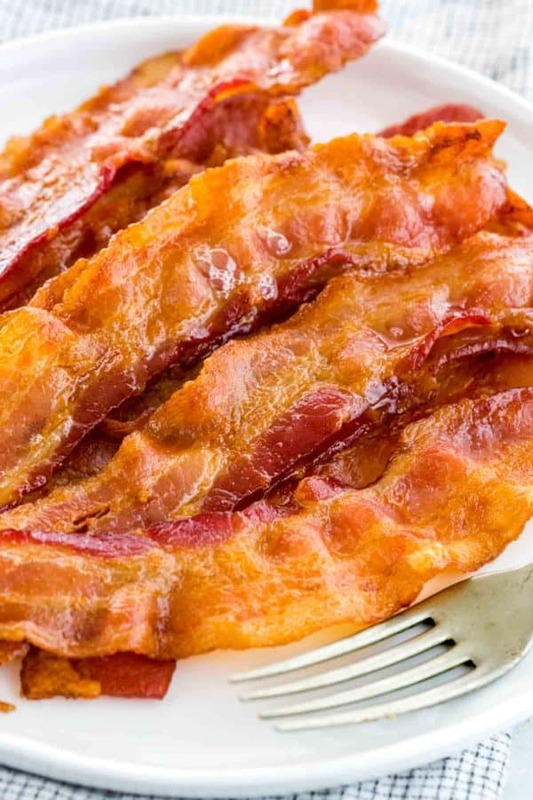 Why are nitrites and nitrates added to bacon? Sodium nitrite (with an “i”) and sodium nitrate (with an “a”) are salts that are often added to cured meats. Sodium nitrite also acts as an antioxidant. Both are food preservatives to help extend the shelf life of meat, reduce bacteria and toxins like botulism, and add a pink or red color to the meats. Uncured bacon without the added preservatives are readily available in the market, however, they tend to have a shorter shelf life and must remain refrigerated. Position the oven rack in the center of the oven. Preheat the oven to 375°F (191°C). Line a large sheet tray with foil. Place the bacon on the pan making sure that they do not overlap. Roast the bacon for 15 minutes. Remove the tray from the oven and use tongs to flip over the bacon. Bake until bacon is fully cooked, about 5 minutes. Transfer bacon to a paper towel lined sheet tray to absorb the excess grease. Eat immediately or once cooled, transfer to a resealable plastic bag and refrigerate for up to one week. Line a baking pan with foil. Place a baking rack on top. Position the oven rack in the center of the oven. Preheat oven to 375°F (191°C). Place the bacon on the baking rack, making sure that they do not overlap. Bake until bacon is fully cooked, about 8 to 10 minutes. Bacon can be refrigerated in a resealable bag for up to 1 week.